One of my favorite restaurants in New York is Basta Pasta. Well, there is something to disclose here; I have many favorites. Hey, it's NEW YORK! And why is Basta Pasta on my list of faves? First of all, its a collision of Japanese and Italian, two cuisines I can eat everyday. And secondly, what is not to love about eating pasta served from a half wheel of Parmesan cheese? If you ask me what is my go-to dish at this place, I really can't tell you. I love everything, especially the pastas. My top three are probably the Spaghetti con Uova di Pesce, the Spaghetti con Prosciutto e Parmigiano (the pasta I just described earlier), and the Spaghetti as Ricci di Mare (you really can't lose with sea urchin). They are relatively simple dishes to make, so for dinner tonight, I am going to make my own rendition of the Spaghetti con Uova di Pesce. It's simply spaghetti pasta, tobiko (flying fish roe), and shiso. Tobiko is pretty easy to find at Asian grocery stores. I was able to get some at a local Korean market called Seoul Market. But if you have a problem finding tobiko at a local store, I found this great website called Fine Food Specialist that sell jars of them. As for the shiso, I substituted with some peppermint leaves and micro-greens from our Eat South CSA. This recipe is great for a weekday dinner when you don't have much time but still want to whip up something yourself rather than ordering take-out. Cook the pasta until al dente and serve about 1/4 cup of cooking liquid before draining. Place reserved pasta liquid and clam juice in a saucepan over high heat. Once it reaches a boil, add in butter. Remove from heat and pour mixture over pasta. Add mint, salt and pepper to taste. 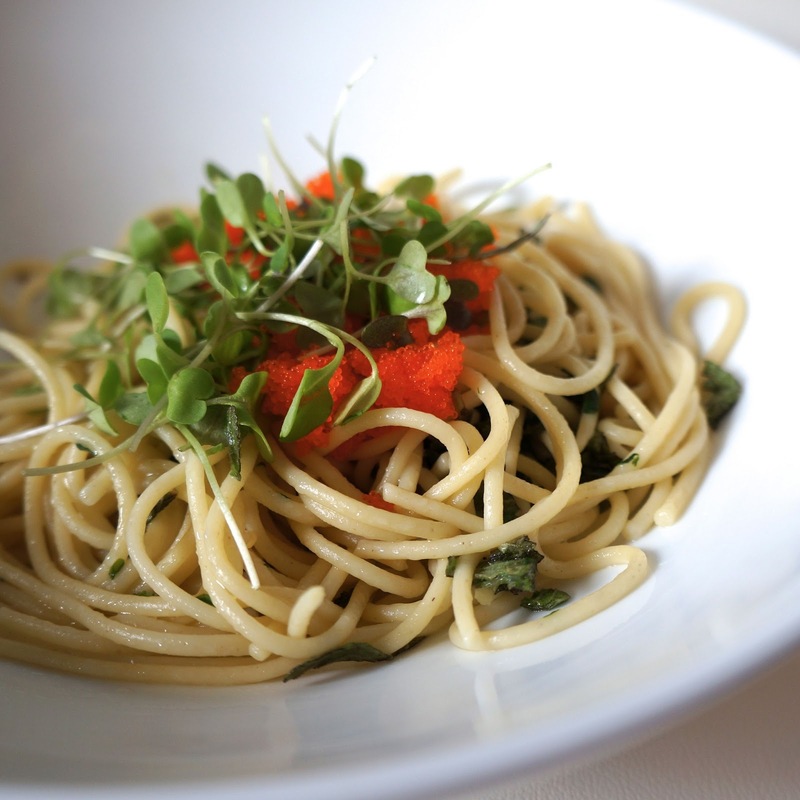 Divide the pasta into two bowls and top with tobiko and micro-greens.